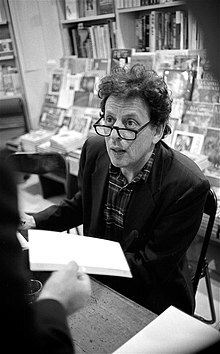 Philip Morris Glass (born January 31, 1937) is an American composer of modern music. He is one of the most influential music makers of the late 20th century. Glass has created operas, music for quartets, dance, and much more. He is known for writing minimalist music. Glass has described himself instead as a composer of "music with repetitive structures". Though his early music shares much with what is called "minimalist", he has since evolved stylistically. ↑ "Philip Glass biography – facts, birthday, life story". Biography.com. January 31, 1937. Retrieved March 29, 2013. This page was last changed on 31 January 2019, at 09:39.